Orders shipping to Alaska and Hawaii as well as Saturday deliveries will be charged an additional $20. Sales tax will be added to orders delivered in Washington State. All orders shipping to California and Hawaii will be subject to an agricultural inspection before they are cleared for delivery. 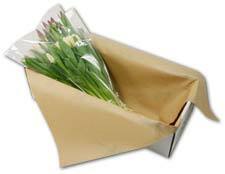 Please Note: Tulips.com cannot be held responsible for wrong addresses, delivery delays due to extreme weather conditions, government mandated agricultural inspections, or recipients unavailable to receive deliveries. Orders must be placed by 10am PST to ensure next day delivery. Area 1: Western states of WA, OR, CA, ID, NV, UT, CO, MT and WY we will add 12 cents per dollar ordered. There is a minimum charge of $10.00 per order. Area 2: All other states in the Continental U.S., which are not listed in Area 1, we will add 15 cents per dollar ordered. There is a minimum charge of $12.50 per order. Area 3: Alaska & Hawaii - we will add 40 cents per dollar ordered. There is a minimum charge of $20.00 per order. Canadian Friends: We will add 15 cents per dollar ordered for shipping and handling. This will include all costs needed for the Agriculture Inspection Certificate and Customs Clearance. There is a minimum charge of $12.50 per order. Canada: ***SPECIAL NOTE*** We are no longer accepting bulb orders shipping to Canada for 2018. Please contact us toll free at 1-866-488-5477 with any questions. Additional Fees May Apply: Tulips.com cannot be held responsible for wrong addresses, delivery delays due to extreme weather conditions, government mandated agricultural inspections, or recipients unavailable to receive deliveries. There will be an additional fee for all incorrect addresses. Cancellations: There is a $25 processing fee for cancelled BULB orders. Orders cannot be cancelled after August 31, 2018. All Gift Shop merchandise pricing is shipped via UPS Ground and is calculated for each individual order.